Are you Salford's next singer super star? Are you Salford's next singing super star? We’ve heard your fantastic singing from the terraces of the AJ Bell Stadium, so why not give it a go on the pitch at Wembley Stadium before this years Challenge Cup final? The RFL, alongside the BBC’s Songs of Praise are looking for a choir of 32 passionate rugby league fans, each from a different club to sing ‘Abide With Me’ before the final on the 27th of August. The competition is open to anybody over the age of 12, and the choir will be selected from people who have made a big impact on their club behind the scenes, whether that be through volunteering, raising money for charity, or just supporting your team through thick and thin. Even if you can’t sing you’ll have a chance to take part in this opportunity of a lifetime! The judging panel will feature Super League star Jamie Jones-Buchanan as well as Songs of Praise presenter Aled Jones. Lizzie Jones, who sang at last years final, in tribute to her late husband and Keighly Cougars player Danny Jones will also be on the panel alongside West-End super star Connie Fisher. 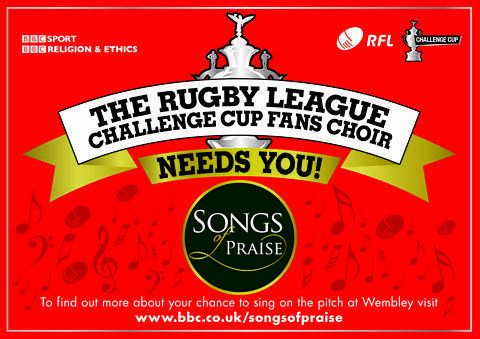 Speaking to BBC Sport, Songs of Praise producer Matthew Napier said: "We want to hear your uplifting and unusual stories about supporting your club and why you think you deserve a place representing your team in the Rugby League Challenge Cup Fans' Choir." Applications close on Sunday 12th June.